Since I posed the questions about the value of girls, or the way girls perceive their value, it seemed like I ought to answer them myself. And really, if you haven’t, I encourage you to go read the comments, all 95 of them. They are breath-taking, and I am grateful to all who shared their stories. What was your socio-economic and geographic setting when you were growing up? I grew up in the oldest, whitest neighborhood in a Southern city with a half-black, half-white population, give or take. In my pseudonymous blogging days, I called it Jane Austen’s Village, because it was the last place in the world where people lived on their so many pounds a year. My father was from an old family that didn’t have a lot of money (not property owners); he grew up in a multi-generational household that moved from rented house to rented house, probably to make room for one more cousin or uncle. My mom did not grow up there, but her mother did, and that family owned a fair amount of land, so they were better off. One of my grandparents (maternal grandfather) graduated from college, after which he had a career in the Marine Corps. My mother was the first woman on either side to graduate from college; my father left college to enlist in the Army Air Corps in WWII, then went straight to law school after the war. What were the expectations for you? I think my dad hoped I would find something meaningful to do with my life, but I may be reading back the pride he felt when I started seminary at age 33. When I was younger he hoped I would get a liberal arts education, but what was to come after that felt very vague. The expectations my mother had were unvoiced. I never had a sense that she looked ahead in my life, only a feeling of being critiqued for whatever I was doing in the present. I used to assume we were disconnected, my mother and I, because I was adopted, but the more I listen to other women’s stories, the less weight I give that factor generally. It is true that when I became engaged, my mother told me my future husband was “noble” for being willing to marry me without knowing my background. 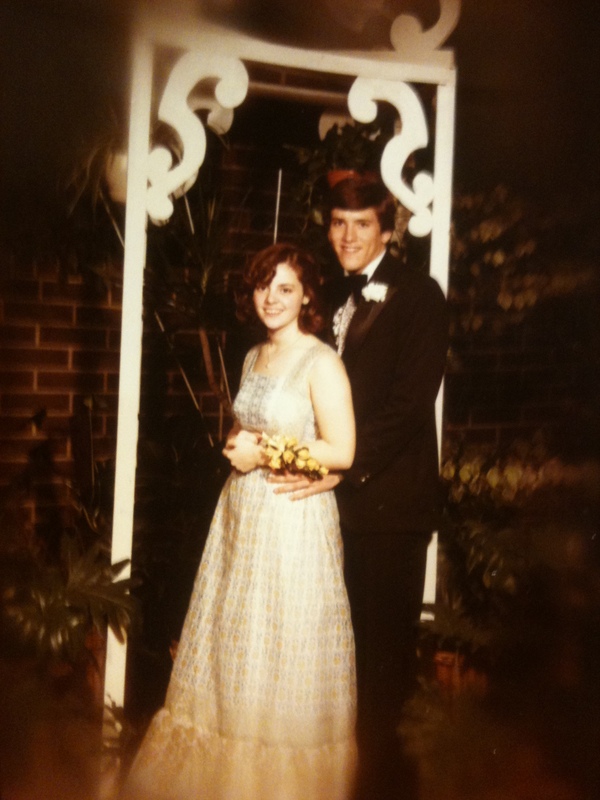 At the Senior Prom, 1978, with the boy who kissed me by the lockers. Who told you what value and success might look like for a woman? My mother told me that a woman’s value derived from marriage to a man who should have enough success for both. And even though I loved my dad, who was a great guy and a success in plenty of ways, I hate it for her if that was her personal definition of value and success. Was that success wrapped up in attention from men? Were there definitions of what kind of attention was appropriate? Absolutely. I was to be attractive enough to get a man interested in marrying me, but without sleeping with him, and I was to remain attractive enough to keep him from sleeping with anyone else. The number of ways in which I failed at fulfilling this rubric is astonishing to calculate, even though I did follow the rule about waiting until the marriage she seemed surprised I managed to have. The real conflict was between what my mother taught and what my dad seemed to value. He liked bright women and women who pursued their interests. He liked it that I was smart. He was frustrated during the periods of time when I couldn’t get it together academically. 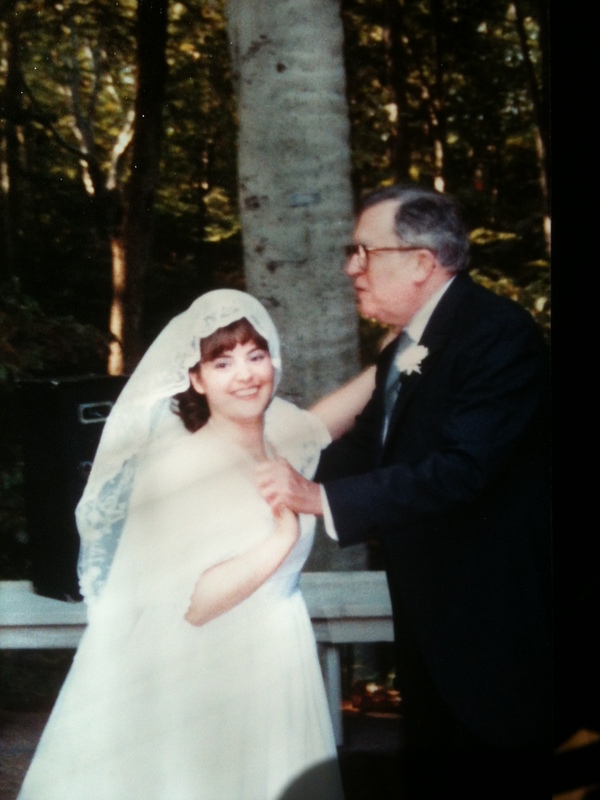 He was dubious about my marriage for reasons different from my mother’s and often said things to me about how a woman should be able to support herself. Was there an a-ha moment suggesting there was something wrong with the whole social construction? No, I bought into it completely until my 30s, when my marriage ended. Although it wasn’t working well, I just kept figuring that if I could do better at the rubric, things would improve. And since I’m reading “The Purity Myth,” did virginity form part of the definition of your value? Lord, yes. And I was Judge-y McJudge-erson about other girls and their virtue, I’m ashamed to say. I’ve addressed that above, but I also want to say that marriage was one thing, but having the wedding was the focus for me. And I understand that to be just as immature as it sounds. I had no idea what lay on the other side. Do your past and/or current understandings of sexual orientation (yours and others) form part of the subtext of this conversation? Sure. I learned that men could be gay at 11 (in 7th grade), when I watched “That Certain Summer” with my mom. 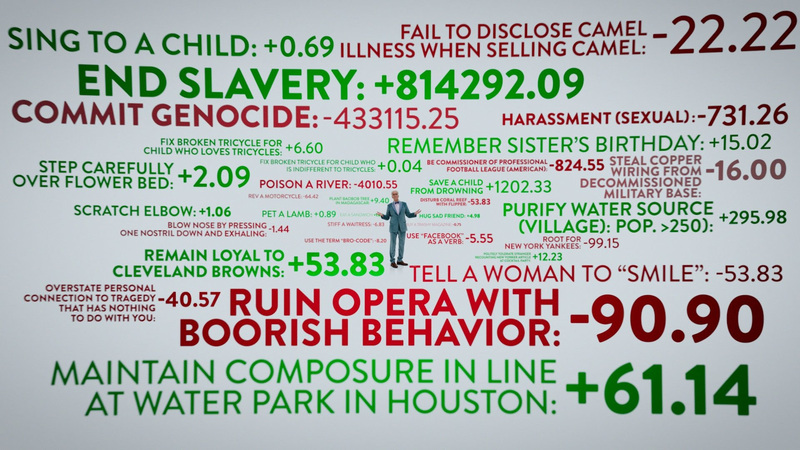 It was a Movie-of-the-Week. “Can that really happen,” I asked? She was surprisingly matter-of-fact about the reality of homosexuality…in MEN. I was in college before I knew women could be other than straight, and the first references I heard to lesbians were cruel and derisive. Perhaps because of that negativity and certainly because my notion of value derived from the philosophy obtained from my mother–and really the subtext was that she might value me if the right man did–it never crossed my mind to be anything other than straight. I choose those words carefully. It never crossed my mind. It didn’t occur to me until much, much later that my heart mattered. I persisted in my attempts to fit into a paradigm that I thought would win my mother’s love. I kept trying, even long after she died. It seemed like the one way I might be able to please her, finally. What’s your basis for valuing yourself now? I am a beloved child of God, and that ought to be enough for anyone, but I fear I put too much emphasis on my professional identity–you know, being fierce and fabulous for Jesus, in a very particular way–and not enough on being valuable simply for being. Thank you again to all who commented on last week’s post. The comments are open here for more discussion, if you like. I’ve been writing vignettes about my past, and there are more to come, as I try to reach a deeper understanding of myself and how I got to be the age I am without figuring out sooner that I’m not straight (in case, gentle reader, you hadn’t caught on to that part, on which there is more to come.) I thought I was pretty much the last girl raised with the post-Victorian genteel Southern attitudes I like to blame for my late epiphany, but I’m discovering that women considerably younger than I am and raised in very different social settings internalized the same ideas about how their value derived from the attention of men. My friend,Lia, said it would be good to have a discussion about it, in longer phrases than the 140 character limit allowed by Twitter, so here we are. Living the dream: yours truly as a bride, dancing with her father, 10/8/83. I look forward to your thoughts and stories and hope you’ll share them here. 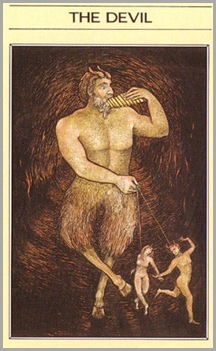 Not too long ago I had my hands on the Devil card from a Tarot deck based on the Greek Myths. Pan gambols, if statically, holding the chains of an unhappy-looking, naked couple. The key to the image is that the man and the woman are actually quite free to walk away. Interpretively it's a card about addictions or habits or ways of being we feel have us trapped, imprisoned, held in chains, and although it's sort of a shocking card to turn over and hold in your hand, it holds the promise of freedom. I looked it up, because before I was a pastor, and even before I was a seminarian, I was a library reference assistant, and I always look things up. Sometimes the chains we let bind us are on the inside, and sometimes they are held by other people, but as the card suggests, usually — usually — we're letting them. Either way, it's hard to get out of the chained-up position. It's the hardest kind of work to admit your situation and to look at what needs to happen to extricate yourself and to take the first step in that direction, and then another, and then another. Sometimes all you can do is breathe, and then breathe again, looking vaguely in the direction of your goal. Even though the epistle tells us the word of God is not chained, I'm afraid there are people who use that same word to chain others, or try to, to create a prison of words of shame and derision and hate, all in the name of God. People, in the name of Jesus, hurt others who are different just because they can. And that's the Devil card, a part of our human nature to take power over others just to make ourselves feel more secure. It's a despicable part of our human nature, especially when it leads to the kind of bullying that drove Tyler Clementi to kill himself. The Devil card reminds me of the line in the Apostle's Creed that I like the least, the one that tells us Jesus descended into Hell. I live in a house where 15-year-olds ask questions such as, "Is it okay for me to be confirmed when I have such a low Christology?" Our view of Jesus, his humanity and his divinity, is a not infrequent topic of conversation. That descent into Hell supports LP's low Christology, doesn't it? It's a human thing to do, to go down into the darkest places, to the cave where the chains bind us, the chains of disappointment and low expectations and past suffering and even other people's authentic cruelty. Even Jesus, according to our faith ancestors, had to go there, for a full human experience. But the Word of God is not chained. It is not. And I believe that Word is Love. So even though I'm having a hard day — a very hard day — and even though I hurt — I really do — I do not despair. The chains are temporal and temporary, mine. And out in the world, the chains that can hurt people are removable, if people who understand God's Word to be Love will say it out loud.